Online casino operators running on software by Wager Gaming Technology or WGS (formerly known as Vegas Technology) are wildly popular among players. One of the reasons for this success is the fact that such online casinos are more than happy to welcome players from the United States. The software developer’s popularity can also be attributed to the premium quality of its offerings which span various table classics like blackjack, craps, baccarat, poker and roulette, a number of video poker variants, keno games, and a myriad of enticing video slots. What is more, the software created by Vegas Technology, now called WGS Technology, ensures players enjoy a smooth and hassle-free experience. The games are available via a downloadable casino client but instant play is also an option for those who are reluctant to install additional software on their devices. Furthermore, the games in the developer’s portfolio impress with their user-friendly interface which renders navigation a piece of cake, regardless of previous experience (or lack of, thereof). Then again, some of the creations of WGS Technology come with huge, progressive jackpots just waiting to be won. Currently, the developer offers a limited number of progressive games, especially in comparison to the options some other software giants provide. The WGS Technology progressives are mostly classic slots, although there is a progressive game to suit the needs of blackjack fans as well. Nevertheless, there is a higher demand for WGS’ progressive slots since they are much easier to play which means that both new and seasoned casino players are given an opportunity to walk away with huge prizes after a single lucky spin. What we know as WGS Technology today started out as Odds On, a company whose roots can be traced back to 1998. In the beginning, the company’s main occupation was providing e-cash systems to various web-based casino operators. However, Odds On quickly veered off in a different direction and started developing casino games software as they noticed how lucrative the online gambling industry can be. It was in 2003 that Odds On was officially merged with one of the oldest web-based casino providers in the industry, English Harbour Gaming Ventures, and Vegas Technology was born. The casino software was given a huge upgrade, which earned Vegas Technology a number of accolades including the prestigious Top New Casino Software award from Gambling Online Magazine. After the introduction of the Unlawful Internet Gambling Enforcement Act of 2006 (UIGEA) in the United States, the popularity of the casinos running on Vegas Technology’s software was on the rise since they were among the few online gambling operators to continue accepting registrations from the States. Despite its global success among players, Vegas Technology was not meant to be and casinos running on its software ceased accepting new registrations as of 2011. This, however, gave birth to WGS Technology – a software company which continued its operations from where Vegas Technology had left off. Currently, the WGS brand boasts a premium gaming library which spans over 150 titles, the majority of which are slots, but there are many options for video poker and table games fans as well. The gaming library is available in instant-play mode where players are not required to initiate a download but simply need to load their preferred games in their browsers. However, there is also the option to download selected games from the portfolio and install them on desktop devices. In addition, the developer has a mobile platform and most of the casinos running on its software offer the games on mobile devices such as iOS and Android smartphones and tablets. Some of the mobile titles are scaled down so that they can fit the smaller screens of the mobile devices, which also reduces battery consumption. WGS Technology is highly-regarded in the online gambling industry for its multi-player slot tournaments, available at selected casinos, running on the developer’s software. Players registered at online casinos using this software can sign up for participation in freerolls without having to contribute with an entry fee. Those who get eliminated at the tournaments’ early stages are provided with the option to re-buy their way in. Slot fans willing to partake can join anytime they like as WGS Technology casinos practically hold slot tournaments on a daily, weekly and monthly basis. Slot fans looking for a massive win are recommended to try out some of the progressive jackpot titles, courtesy of Vegas Technology. Since each bet made on the progressive slots contributes to the prize pool, the pot grows continually to reach rather tempting sums of money. Players should remember that they need to bet the maximum allowed in the progressive games in order to qualify for the entire jackpot amount. In most instances, those who have triggered the hefty prize, but have bet one or two coins on the lucky spin are granted only a specific percentage of the overall pot. Do have in mind that the developer’s progressive slots usually have fixed coin denominations, meaning that there is a single coin value and players get to adjust only the number of coins they bet per spin. In most cases, the maximum bets are set to three coins. 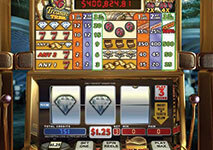 Nevertheless, the coin values differ from one slot to another, allowing players to choose a progressive title which corresponds to their individual bankrolls. At the present moment, there are about seven WGS progressive slots to choose from. Although the developer’s progressive games appear to be more simplified in terms of graphics and animations as most of them utilize three reels only, they are definitely worth your while since the prizes usually escalate to six-figure sums. You can check our short overviews of five of the most popular progressive slots by WGS/Vegas Technology below. Lucky players who hit the progressive pot on this classic slot truly get to live the American dream as the prize is rather impressive and thus, is definitely worthy of a few spins. Red, White & Win is 3-reel slot with a single payline which offers outstanding graphics with America-themed symbols such as the US flag, the image of president Washington, an American bald eagle, the Statue of Liberty, and the good old greenbacks. Making a bet on this progressive slot is easy as pie since the interface is quite simplified and allows for a hassle-free navigation. The coin denomination is fixed at $2.50, with players having the option to bet up to three coins per spin for a maximum wager of $7.50. Since this is a classic slot, it kind of lacks in terms of extra features so players should not expect to see wilds, scatters or bonus games. However, there is an Autoplay functionality which facilitates a predetermined number of spins. 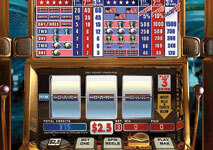 The progressive jackpot varies and the current amount is displayed in the jackpot meter above the paytable. In order to pocket the appealing prize, players are required to hit three symbols with the US flag on each reel across the payline. As mentioned previously, you need to make the maximum bet of three coins in order to qualify for the pot. Players who trigger the prize with a one-coin bet will be awarded only 5% of the current pot. Landing the jackpot combination on the reels with a two-coin bet renders you eligible for 10% of the overall progressive prize. If you are looking for a massive progressive prize to bag, Mega-Money Mine is another great alternative, courtesy of the renowned software developer. 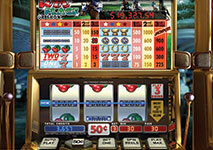 This is yet another classic slot with a clean interface, three reels, and a single payline. The software supplier has once again opted for traditional symbols on the reels, which include the well-known bars, lucky sevens, cherries, and diamonds. To keep in line with the game’s gold-mining theme, WGS/Vegas Technology has added the additional shovel symbol. The great thing about this progressive slot is that it has lower betting limits, which renders it fit for players with more humble bankrolls. There is the option to bet up to three coins per spin, with a flat value of $1.50. Do have in mind, however, that wagering the maximum will not only qualify you for the huge prize but will also earn you higher paytable multipliers on regular winning spins. 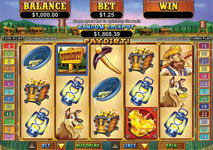 If you wish to end your session as a jackpot winner, all you need to do is line up all three Mega-Money Mine symbols across the payline with a maximum bet of three coins. One-coin bets can potentially earn you 15% of the overall prize, while players who have landed the winning jackpot combination with two-coin bets are entitled to 30% of the current pot. This is an old-school, 3-reel progressive slot which was designed to resemble the one-arm bandits in landbased casinos as closely as possible. The game is considered a suitable option for players looking for a straightforward, simplified experience, without the distractions of special features like bonus games and free spins that are commonly associated with advanced video slots. There is a fixed coin denomination of $1.00, with players having the choice of betting up to three coins at a time. Players should keep in mind that each additional coin they bet will boost their multipliers on winning combinations. Of course, the prize all slot fans are aiming for is the colossal progressive jackpot. The entire pot is awarded to the player who has hit three Fistful of Dollars symbols on the single payline with the maximum wager of $3.00. Hitting the jackpot combination with a single coin would result in the player collecting only 15% of the progressive prize, while betting a second coin would boost one’s winnings to 25% of the current amount. Treasure Trail is yet another enticing 3-reel progressive game, offered by WGS Technology. Being a classic slot, Treasure Trail incorporates only one payline. Slot fans the world over would surely appreciate the game’s treasure-hunt theme and the suitable symbols it employs. These include treasure chests and the X-Treasure symbol but of course, the standard lucky sevens and gold bars also appear on the reels. Despite being a 3-reel classic slot, Treasure Trail comes with an additional feature which can potentially increase players’ profits on lucky spins. The X-Treasure symbol actually functions as a wild here and has 2x and 4x multipliers attached to it. The maximum bet stands at $3.75, with the option to wager between one and three coins of $1.25 value on each spin. The progressive prize is unlocked when players hit three wild symbols across the solitary payline. Bets of one or two coins can potentially reward you with 15% or 25% of the pot, respectively. Win, Place or Show is yet another classic slot by what is now known as WGS Technology that can potentially transform players’ lives with its gigantic progressive pot. 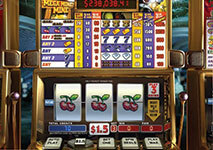 The software developer once again adheres to the traditional 3-reel, 1-payline format and has picked symbols like cherries, lucky sevens, bars, gold trophies, and horseshoes. Players with a limited budget also get to compete for the huge prize since Win, Place or Show offers fixed coin denomination of $0.50, with a maximum bet of $1.50 only. Those, who succeed in landing three gold trophy symbols across the payline should brace themselves for collecting the entire jackpot. But even if you fail to make that life-changing spin on the reels, fret not. There is a flat jackpot of 1,000 coins for those who hit three trophies with a two-coin bet, which is still a good deal.